Blake drinks a lot of water now,he use to be really fussy and not like drinking it. He has only tried juice once and he wasn't too keen which can only be a good thing. I want Blake to grow up loving water as I am pretty rubbish at drinking it myself. I can go a whole day without drinking anything and then remember just before bed. Blake has a wide range of cups from straw ones to general sippy cups from a wide range of brands. 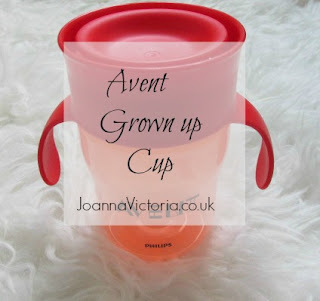 But the Avent Grown Up Cup is a little different. 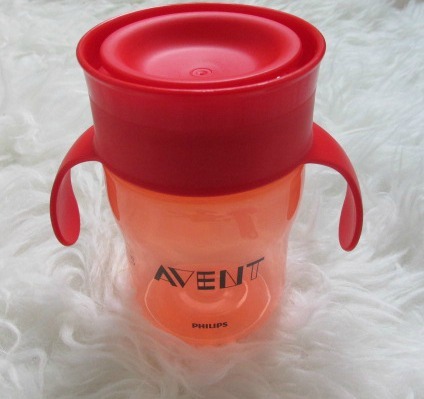 The revolutionary Philip's Avent cup helps your toddler to transition to grown up drinking. The unique spill-proof valve is lip activated and allows drinking from around the rim. I was a little unsure if Blake would drink from it as he can usually be fussy. However I needn't have worried as he was able to drink from it with ease. We like that it has handles so that Blake can hold it easily (although he likes to fling it across the room). This means that he can drink independently without our help. We also like that it encourages Blake to drink from around the rim like an adult cup. We also like that the cup also comes with a protective hygiene lid for keeping the cup clean. The bottle is easy to clean we just pop it into the dishwasher and give it a little rinse afterwards and its good to go. Have you tired the Avent Grown Up Cup? If not what cup do use with your little one? We have a few cups like this and they are fab! I've not tried this cup with the girls but it looks fab! that looks a great cup - they seem to always come up with new ideas to make things easier! "The lip activated valve is great as it means no mess" - that's me sold! I've not seen this design before but I'm intrigued. Wow I love the no mess feature that is especially useful with younger children who are prone to making a mess. Love the design. Ooh this sounds exciting. With our Pickle not yet born we're not quite at sippy cup stage yet but will definitely be looking into things like this in the future - you're right, I'd love our little one to grow up drinking more water than I do myself. I think I should start trying to lead by example! Drinking as they get older always worried me! Great product for helping reduce spills.